In the previous issue, I promised an article on these two ministers, but in so doing I committed an error of presumption which in the lifetimes of Donald Macfarlane and James Macniven would have earned me a stern rebuke. I described them both as 'Church of Scotland', when, in fact, Macniven was Free Church. Not surprisingly in 2016, no one appears to have noticed! The name Donald Macfarlane came up in an article by the writer George Blake (No. 77, p 21), who went to Gigha in the winter of 1917 to convalesce from an illness contracted in Gallipoli. The Great War was about to enter its final year, and Blake recalled that Macfarlane, the parish minister and 'a saint', would not let him play, or even mention, any composer of German origin, when the two of them got together at the manse to engage in music-making, Blake on the piano and Macfarlane 'roaring out' Gaelic songs. A long-time resident of Gigha, Mr John Martin, having read that article, brought me a biography I hadn't known existed, Donald Macfarlane of Gigha and Cara, written by a fellow-minister, Sydney Smith, and published in 1925, two years after Macfarlane's death. I was, at the time, researching Macniven families in Kintyre and had come across a contemporary of Macfarlane's, the Rev James Macniven. Both were born in Muasdale within four years of each other - Macfarlane on II February 1861 and Macniven on 31 December 1864 attended nearby Cleit school, graduated from Glasgow University and became notable preachers. The duality seemed to me quite remarkable, since Muasdale at that time scarcely merited the description 'village', being little more than a scattered community of farms and fishermen's cottages, with an inn and the manse in which Macfarlane was born. At that time, and into the twentieth century, clerics could attain celebrity status, at least locally and in exceptional cases nationally. That status was largely earned in the pulpit, sometimes in tandem with acute Biblical scholarship and sometimes nol. Oratorial prowess mattered then, not least because religion mattered, and ministers were, in a sense, entertainers, at a time when other forms of public entertainment were limited, especially in rural communities. A 'good preacher' commanded respect and attracted audiences, and the best of preachers could fill churches by reputation alone. Macfarlane and Macniven were both, by all accounts, among the best of their generation. I'll begin with Macfarlane, first-born of the two, and explain at once that his life-story will be the more detailed, thanks to that biography by Sydney Smith. His father, also Donald, was for 28 years minister of Killean and Kilchenzie Parish, on the west side of Kintyre, and was remembered for his 'rich voice, poetic imagination and popular appeal', and as 'an enthusiast in the cause of the education of the people'. He was born in Tarbert in 1819, son of a boat-builder, Duncan Macfarlane, and died in 1879. In 1858 he married Anne Kennedy, daughter of the Rev Alexander Kennedy, minister of Jura. He wrote one now- forgotten book, Eachdraidh Aithghearr mu Eaglais na h-Alba ('A Brief History of the Church of ScotIand'), published in Glasgow in 1863. 'Our' Donald was the second-born of eight children. His religious life was not without crises, but these will be addressed later. First there is the young Donald, growing up in the imposing manse next to the shore, where he came in contact with the local fishermen and from whom he learnt the skills of sailing and acquired an enduring love of boats and the sea. He and his young companions, seated on the stem-board of a small boat and casting white flies, would fish for saithe along the sunken offshore reefs. He was just 13 years old when he left Muasdale to study at Glasgow University - 'a foolishly early age', as a fellow-student, Rev James A. Houston, remarked in a posthumous appreciation (Campbeltown Courier, 24/21\ 923) and on Saturday afternoons he'd gravitate to Broomielaw Bridge to 'watch the loading and the unloading of cargoes, and sailing many a dream voyage'. He would later maintain that if any ship's captain had asked him to join his crew, he would have needed no second invitation. Smith records a delightful example of Macfarlane's humour which belongs to his boyhood in Muasdale. The joke depends on an exquisite pun, but was destined, by its dialectal nature, for obscurity. One morning his father's hired man, who worked the manse glebe, overslept, and Rev Macfarlane was heard to complain, because the sea had overnight cast ashore a mass of seaweed which his servant should have been busily gathering to spread on the land as fertiliser. Seaweed was, and still is, locally known as 'wreck', from 'wrack', and young Donald quoted a line from Charles Wolfe's patriotic poem 'The Burial of Sir John Moore after Corunna': 'But little he'll reck if they let him sleep on.' 'Reck' is 'care', but for 'reck' read 'wreck': the act of spreading seaweed! When Donald went to Glasgow University aged 13 - so small in stature that his gown trailed on the ground - his proficiency in Latin and Greek, thanks to his father's tuition, was more than adequate, but most of his fellow-students were older than him, and the lectures he attended were often beyond him. Although his class work in Hebrew was 'highly satisfactory', the language itself bored him, and the 'special difficulties' he encountered in the Natural Philosophy lectures of Lord Kelvin (William Thomson) 'were so many and so great that tears would start to his eyes'. Nevertheless, in 1879 - the year his father died - Macfarlane graduated in Arts at the age of 18, and three years later, in 1882, was licensed to preach by the Presbytery of Glasgow. At the end of that year, having served briefly as assistant at Partick Parish Church, he was ordained as minister of Morven, a mainland parish in north Argyll, facing across to Mull. The date of his ordination was 13 December 1882, when he was just 21. He was conscious of his youth and inexperience, and these misgivings were intensified by 'the high ministerial traditions of the parish' , namely his immediate predecessors Norman Macleod and his son Dr John MacLeod (an uncle of the illustrious Rev Dr Norman Macleod, who was born in Campbeltown in 1812 and at the age of 12 sent by his father, also Rev Norman, minister of the Highland Parish Church, to Morven for immersion in Gaelic language and culture: see 'MacLeod of the Barony', by Murdo MacDonald, in No. 72). Macfarlane's own misgivings appear to have been shared by - as his biographer, Sydney Smith, put it - 'ministers of the Church of Scotland who were recognised as unofficial Bishops of the Highlands'. He had little encouragement from them and 'felt his isolation keenly'. His self-confidence was further undermined by a controversy following a social gathering in Tobermory, Mull, at which he spoke. During his talk, he touched on the subject of 'the various excuses ... made for non-attendance at worship'. It appears to have been a comedy skit, during which he presented 'different types ... exhibited them in a light that caused amusement, and despatched them, each one, with a light stroke of wit'. Unfortunately for him, his performance was reported in a newspaper, doubtless the Oban Times, whose correspondent mistakenly associated the sketches with the folk of Morven. Some of his parishioners claimed to recognise themselves in the portraits 'and it was some years before an offence based on misunderstanding was forgiven'. During his earliest years at Morven, he was alone at the Manse, his solitude broken only by occasional visits from family members. As an indication of the extremity of that loneliness, after one of his visiting relatives had left, Macfarlane, in a letter to a friend, expressed the 'whimsical intention to go to Loch Aline and kidnap a passenger from one of the MacBrayne steamers'. Early in his ministry, his 'love of joke and song' drew him to social gatherings in the houses of certain of his parishioners, but latterly he 'took less and less pleasure' from visits to these ceilidh houses. His glebe - the portion of land assigned to a parish minister in addition to his stipend, or salary - was 'a trial from the first'. The sea was his natural element, and he had no interest in the land. He would later joke, 'I yield to no one in my ignorance of agricultural affairs', but at that time his mood was far from jovial. The parish was a large one and his duties demanding. Smith: 'Often the horse could not be spared from the glebe, and the minister had to tramp his long miles.' The hired man who had charge of the glebe was often a disappointment to him, and he would complain that 'inferior servants had a way of gravitating towards Manses, and superior servants of deteriorating in them'. Macfarlane's own vocational commitment was deteriorating and reached a crisis during his ministry in Morven. Sydney Smith, in his biography, does not actually question the integrity of Macfarlane's calling, though he docs suggest that his parents were both keen that the ministerial succession should continue, and notes that 'all the sons except Donald said that they were not going to be ministers'. Smith also records, but scarcely analyses, a curious exchange between father and son during Donald Senior's final illness, when 'he is stated to have obtained a promise from his son that if he were to come to question the creed of the Church he should leave its ministry'. He discussed resignation with his mother, a minister's daughter as well as the widow of a minister, but she persuaded him to 'hold on till he should have paid his debts'; and to her he would attribute his eventual recovery. At about the time of his greatest crisis, he was thrown from a dog-cart and severely injured. 'In the silence of his enforced retreat,' Smith records, 'the light of Heaven broke forth', and to his ministerial duties he brought 'a new spirit'. This personal transformation coincided with a change in his domestic circumstances, for his mother and a sister came to stay with him in the manse at Fiunary, which became an altogether more hospitable resort for the needy of the parish and beyond. He was particularly sympathetic towards 'tramps' and 'tinkers', and had part of the barn 'made ready for such rovers of the road'. Towards the end of his 25-year ministry in Morven, a 'local issue' emerged on which 'he felt he had to take a stand, and he did so at considerable cost to himself. Smith reveals no more than that. At the same time, Macfarlane suffered the recurrence of a medical condition, 'inflammation of the eyes', which first appeared during his university years. He became unwell, and the Presbytery of Mull granted him six months' leave, which he used to visit the United States and Canada, where his brother Robert farmed in Manitoba. His tour took him from New York to Niagara, Chicago, Minneapolis and Winnipeg. He preached in Chicago, and in Winnipeg was offered a charge, 'but he was yearning to preach again in Gaelic', and Gaelic sermons were not wanted in that particular location. Also, 'he was sick for the sea and the hills'. After four months, he cut short his holiday and returned to Morven, greatly refreshed but 'resolved on a change of sphere'. That change was the Parish of Gigha and Cara, where a vacancy had arisen. A friend, 'who had come to know his mind', intimated to the vacancy committee that if the congregation were disposed to call him, he would accept that call. The response from Gigha was positive, and on 12 February 1907 he was admitted to that charge. He took with him his sister Jessie, who would be his housekeeper and companion for the rest of his life. She and another sister, Annie, had been with him for 20 years, but Annie had married shortly after his return from America, and her departure helped persuade him that his time in Morven should end. He had been very close to her and had shared with her 'many sacred thoughts and feelings, and her departure changed the aspect of Morven for him'. He sometimes gave, as his reason for leaving Morven, the situation of the manse at Gigha. He would quote a Gaelic proverb, 'If you cannot get back to the place where you were born, try to get within seeing distance of it'; and, from the windows of Gigha manse he could see his father's old manse at Muasdale. The Gigha manse, when he moved in, had 'little to recommend it', being a 'bare, gaunt, narrow-gabled, high building'. The church itself was no less a disappointment. From the outside, it looked like a hall 'in which some of the windows had been an afterthought', and the interior was badly ventilated and poorly furnished. Macfarlane soon resolved to build a new church and began fund-raising, but he would not live to see the new church. It was completed in the year after his death, and contained a stained glass window in his memory. He had, Smith remarked, 'a liking for "Catholic" forms of architecture for which the stock from which he was derived and the environment in which he was brought up hardly prepare us'. The attraction was in part aesthetic and in part spiritual. He was once heard to say, on emerging from a cathedral, that 'it had been to him a sanctuary, a place in which he could draw near to God'. Remarkably for his time and position, he espoused views which were clearly ecumenical. When the subject of Christian unification came up, he would exclaim, 'Nothing can keep it back', a conviction which Smith explained thus: 'The strength of that assurance arose from the fact that he was both Presbyterian and Catholic in his sympathies, that there was in each of these systems and their forms something to which the chords of his heart responded.' This openness of spirit may be contrasted with the view of the Rev Dr Norman Macleod (p 4) who 'had for Popery, and every semblance of Popery, a perfect hatred'. After his spiritual crisis in Morven, Macfarlane had embarked on an intimate study of the Bible, to which he strove to devote an hour and a half each morning. In Gigha, a much smaller and less demanding parish, this 'engagement made with himself became more practical. Rev OJ. Macdonald, who succeeded Macfarlane's father in Killean and Kilchenzie Parish, remarked in an appreciation (Campbeltown Courier, 10/3/1923) that Macfarlane 'had an eye for the Bible within the Bible' and 'loved the written word'. In Macdonald's estimation, Macfarlane excelled both as preacher and pastor. Smith devotes a chapter of his biography to the pastoral side of Macfarlane's ministry on Gigha, and reveals 'an expert in man-fishing', who would prepare himself for a visitation by concentrating on a particular subject which interested the parishioner on whom he was to call: Gaelic song, place-names, the novels of Sir Walter Scott, or whatever. 'Many ministers have at most one or two flies. Macfarlane had a book of them, and he "made them himself'.' He also possessed, Smith believed, 'an unerring touch in consolation'. To the wounds of separation and loss in others, he applied the balm distilled from his own sufferings and ultimate 'deliverance from spiritual death'. Macfarlane died on I 0 February 1923, a day short of his 62nd birthday. His brother Robert sat and read to him far into the night, which helped him bear his pain, and he died in the morning. On the cause of death, Smith is vague, but the death certificate, signed by Dr J. T. Malloch, Muasdale, states 'tuberculous disease of sternum and mediastinal glands', of three years' duration, followed by cardiac failure. No fewer than eleven ministers attended his funeral on Gigha, four from Kintyre and the others from various other parts of Scotland. One name especially caught my attention, 'Rev. Mr Maclean, Daviot, Inverness-shire', who, with Rev Norman Maclean, was Sydney Smith's main source of information for the biography. This was Alistair Maclean D.O., father of the novelist Alistair Maclean, popular author of The Guns of Navarone, Ice Station Zebra and Where Eagles Dare, who had yet to attain his first birthday when his father travelled south to attend Macfarlane's burial. Rev Maclean was minister in Tarbert, Lochfyne, from 1910 until 1913, and it may be assumed that he and Macfarlane became acquainted during that period. The pall-bearers at the funeral included three of his parishioners, John Macdonald and John Wotherspoon, elders, and Isaac Love, session clerk. If James Macniven, to whose life this account now turns, knew Donald Macfarlane other than by repute, there is no evidence of it. Despite their shared origins in Muasdale and parallel careers, no biographical account of either suggests that they were familiar with each other, which seems strange, even considering they belonged to different Presbyterian creeds. Macniven's upbringing was less propitious than that of Macfarlane, who had a line of ministers at his back, particularly on the maternal side. Macniven was born in 1864 on South Muasdale farm, the son of Angus Macniven, a tenant farmer of 115 acres, and Isabella MacSporran. His father appears to have died while James was still a child. In the census of 1871, seven years after his birth, his mother is recorded at South Muasdale as a 39-year-old widow with three daughters, Janet, Margaret and Mary, and a son Donald (in a Courier report of 7/9/1912, on James's translation from Ardnamurchan to Uig, Donald is mentioned as living in Longrow, Campbeltown). There is no mention of James in the census entry; I presume he had been placed with a relative, but could find no trace of him elsewhere in the parish. Nonetheless, Fasti Ecclesiae Scoticanae - the biographical record of Scottish Presbyterian clergymen - states that he was educated at 'Kilbean P.S. ', clearly meaning 'Killean Primary School', which was effectively Cleit. And the report of his death in the Campbeltown Courier (29/10/1932) describes him as 'outstandingly a "lad 0' pairts", from the day he entered Cleit School, Killean Parish'. Already, there forms the impression of a studious, serious-minded individual. Macfarlane detested Hebrew and gave it up as soon as he had enough of the language to fulfil the requirements of his education; Macniven immersed himself in Hebrew, though he ultimately chose the life of a parish minister before the life of a scholar. And Macfarlane was more a man of action. Smith: 'He drew naturally to men of outdoor pursuits, and he understood them. He was very much himself on the road, among the hills, by the streams, by the shore. He could swim with powerful stroke, fell a tree, sail a boat. He knew the names and habits of the sea-birds and could imitate their cries.' For him, 'The habit of introspection tended to throw a veil over the radiance of the world', and in later life there was but one book he cared to study: the Bible. Macniven, by contrast, 'lived a quiet, secluded life with no hobby except his books'. His 'friendships were wide', yet he had 'no particular friendships' and, like Macfarlane, he never married. He 'loved to preach' and averred that preaching was 'the only joy of his life'. And preach he did: 'Whether it was his duty to preach three, four or five times each Sabbath, he was equally able and prepared.' His ability as a preacher was widely recognised and his services were in great demand, particularly at Communion time. It was remarked after his death that 'There were few pulpits on the West Coast or in the Isles in which he did not preach'. 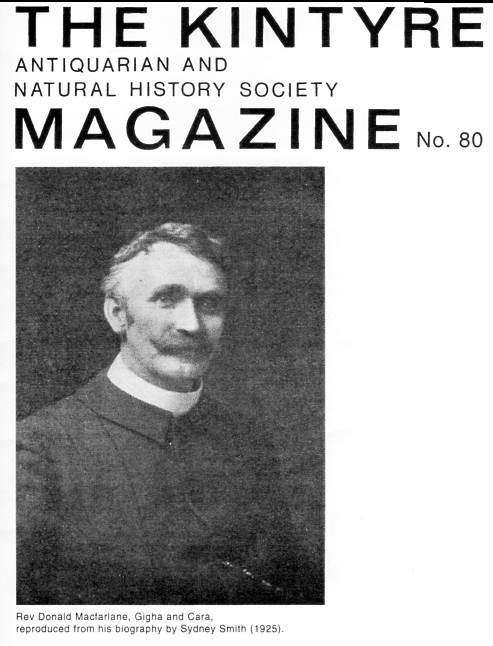 One of his fellow-ministers maintained that 'None stood in shoe leather in our time that was an abler preacher than James Macniven', and there is the testimony (p 14) of James Bowman, Professor of Moral Philosophy at Glasgow University, who, in 1930, listened 'spell-bound' as Macniven delivered - presumably in English - a 'masterpiece of pulpit exposition' on Saint Augustine in the little Free Church at Lochcarron, Wester Ross. He was buried in his native Killean Parish four days after his death at the age of 68. His parishioners carried the coffin a mile to a 'motor', in which his remains were conveyed from Lochcarron to Kintyre. The burial service was conducted by the Rev John Mackenzie of Lorne Street Gaelic Free Church, Campbeltown. With the exception of Finlay Murchison, Lochcarron, and the Rev Donald Macleod, Applecross, the pall-bearers all belonged to Kintyre, and many of them were probably relatives: Robert McArthur, James McArthur, D. McGeachy, Gaigan (Muasdale), D. Armour, Kilkeddan, D. MacCallum, A. Macmillan, Whinhill, and John Taylor, Muasdale. His surviving immediate family consisted of two unmarried sisters in Campbeltown. Both died at 68 Longrow in the following year: Janet, aged 65, on 2 March, and Margaret, aged 63, on 12 December, described, in her death notice in the Campbeltown Courier, as a 'dressmaker' and the 'last surviving member of the family of Angus McNiven, farmer, Muasdale'. The name Macniven is found in Kintyre from the eighteenth century, predominantly in the Muasdale area, but has since disappeared entirely. Coincidentally, on the same page of the Campbeltown Courier (29/ I 0/1932) as the death of James Macniven was reported, the death of Sydney Smith, Donald Macfarlane's biographer, also appeared. Rev Smith was minister of St Andrew's Church, Roslin, Midlothian, when he died suddenly at the age of 59. In the year 1892, after being licensed to preach by the Presbytery of Skye, I was appointed to the Mission of Kyleakin. After two Sundays there I got a summons to go and see Dr Norman Macleod at Inverness, and at an interview I was enjoined to go to Benbecula, the island that lies between North and South Uist, for there was some dissatisfaction there owing to the missionary having been removed without the congregation being consulted. I went reluctantly. For to a Skyeman the outer isles are like banishment; and I had no knowledge of the ways of Roman Catholics. The four months that I spent in Benbecula were made memorable for me by the fact that Donald Macfarlane came thither in mid-summer to celebrate the Holy Communion and to preach for the five days consecrated to the Ordinances. I was staying in a little inn near the Benbecula end of the North Ford. The sound of the tides rushing over the sands was ever in the ear. The long line of boulders marked the track along which traffic could pass across the sands when the tides were low. The surface of the island consisted more of fresh water lochs than of land. It is one of the most isolated and lonely spots in the world. And there, in the lonely inn, we lived together, Donald and myself, for ten days. He was then thirty-one years of age, and I was twenty-three. But in wisdom, in experience and in knowledge of life he was a whole generation older than I was. And on my young, impressionable heart he left an indelible mark. For me he opened a door into a new world. He did that solely by his personality. It was through the element of surprise that he took me by storm. He was utterly unlike any minister of religion whom I had ever met. In the Hebrides a minister of those days was a man whose spirit was ever wrapped in gloom. The more zealous and religious his flock, the deeper was the gloom over their minister's soul; he was for ever trembling for their morrow ... But Macfarlane was as different from that as day from night. The first morning after he arrived (he came in the darkness across the ford in a dogcart, with the tide up to the axle) he awoke me with his singing. He had a beautiful voice and he loved to use it. An old psalm tune or a Highland ditty - whatever it was, he would pour out his heart. And at breakfast he began to tell me stories. How he could laugh! There was no professional piety or cant about this man. And after breakfast he went, as if joyously, and got his Bible. The way he read and prayed showed that he had entered far into the secret place of the Most High. I do not remember that he offered me a single word of advice in those ten days, but I learned a great deal. One thing I did learn was the folly of sectarianism. This man, who seemed to my eyes the ideal minister, allowed no wall to separate him from his fellow-Christians. Whether they were Free Church, or Baptists, or Congregationalists, or Roman Catholics, he had a good word for all of them. I still remember the smile with which he told me that he never used the designation 'The Manse' when he wrote to people who did not belong to his own Church. He called it as a rule 'Fiunary Manse'. Nor would be put 'F.C.' or any other letters before any minister's manse. He wanted them all to feel that theirs was the parish manse as well as the men who called their houses so. It may sound quixotic. But that was Macfarlane in the fineness of his spirit. He would arrogate to himself no superiority in any way over any brother in Christ. His whole life through and through was woven of that same pattern. In those days in the Hebrides, good and religious people had developed a genius for hating each other. As one looks back on it across thirty-two years, it seems incredible ... It was a new thing for me to hear Macfarlane speak as if the minister of religion could never have aught to do with anything but love and peace and goodwill. I vividly remember walking with him towards a wonderful sunset when the whole sky was aglow as the sun went down, 'swimming in glory'. 'The minister who gives way to hate is ruining himself,' said Macfarlane. 'He is a foolish man for he does nobody any injury but himself. The law of the land prevents him from injuring the man he hates. The person who is hated may not even know that he is hated. The only person injured is the man who allows the passion of hate to darken his mind and to harden his conscience. He is putting out the fire. in his own heart.' I had never before heard anyone speak like that. To hate the opposing faction was a sign of zeal and godliness! 'I hate them with a perfect hatred,' was a favourite quotation. But here the sophistry was brushed aside, like cobwebs by a broom. I learned that there was a law: 'Love your enemies; bless them that curse you.' And the law became a reality because it shone through a man's loving personality. In those days in the Hebrides a teetotaller was unknown among the clergy. I had never come across any of that persuasion. The people generally regarded them as of an inferior order - unable by reason of weakness to carry their liquor, and therefore bound to abstain! I do not know that even today there are many teetotallers in the Hebrides. It was a great surprise to me to discover that Macfarlane was a strenuous teetotaller. There was nothing weak, or effeminate, or namby-pamby about this man, and yet he would not touch alcohol. He told me of the evil fruits he had seen: of the wreckage that strewed the streets of Glasgow. 'I wouldn't touch it for the world,' he said. A congregation in Glasgow approached him with an offer to appoint him their minister. He enquired and found that many wine-merchants and publicans were in its membership. 'I refused at once,' he said. 'I couldn't be minister of a church of that sort.' And, doubtless, being the man he was, he did the right. That ardent soul of his would dash itself in pieces against that rock. The time was not yet ... But I confess that, in this matter, Macfarlane did not impress me at the time as I ought to have been impressed. I looked on his attitude as a vagary of spiritual genius. It took me twenty-two years before I realised how supremely right Donald Macfarlane was in that witness of his. When the Great War made the scales fall from my eyes, I saw Donald Macfarlane at the ford in Benbecula with a fresh realisation of the clearness of his spiritual vision. It was shortly before I met him that he came through the great spiritual experience which changed his whole life. I do not know exactly what form it took; but it certainly was an experience of the hidden flame in his soul. It must have been an experience such as Pilkington had on the island in Lake Victoria Nyanza when it seemed to him as if he had found God for the first time. It was like that with Macfarlane too. He suddenly realised the presence of the Holy Spirit in the heart, and lot All things were made new. The Bible was lit up for him afresh as the glowing tale of the workings of the Spirit; and the ordinances of religion and the great Sacrament were but the channels through which the Spirit came to the seeking soul. The whole spiritual forces of the man were unloosed by this realisation. He felt God; he lived in the very presence of the Eternal; he passed his days in the companionship of the Master; he was never less alone when he was alone. And there came into his preaching that note of intensity which set the hearts of the listeners vibrating. I never heard him preach in English, but I know that he preached in that language with literary grace and perfect diction. It was the Gaelic that he loved best; and it was in Gaelic that he preached in Benbecula in those far-gone days. It was preaching of an order quite new to me then; and I have heard little to excel it since. It was preaching with the note of evangelical passion pulsating through it. I still remember the Action sermon on that second Sunday of July, 1892, in the church of Benbecula. His illustrations suggested to the hearers that this preacher knew the whole Bible as if by heart. And at the end he broke into a chant - sending forth his appeal with a rhythmic beat. The Welsh call it hwyll. With his spiritual intensity and musical voice it caused a wave of emotion to pass over the congregation. And then he celebrated the sacrament. It seemed to me strange that he gave no address after the Table was served ... 'I want them to go away feeling that God alone has spoken to them at the last.' That was his explanation when I asked him. After the service on Monday in Benbecula an old woman waited at the church door for him, and holding his hand she said in softest Gaelic: 'Happy is the congregation to whom you return as you go home.' Macfarlane referred to it two or three times: it cheered him so. One day we drove across Benbecula and over the South Ford, and to the house of Mr Roderick MacDonald, Minister of South Uist. 'Mr Ruari,' as the islanders called him, was a minister of the old school, a gentleman of courtly manners and a man of wit and learning. In another sphere he would have risen to eminence; but isolated among an overwhelming Roman Catholic population, he never had the opportunity for using his gifts. He was a master of Gaelic; and at a later day I heard 'Mr Ruari' dispense the Sacrament in Gaelic with a solemnity and a beauty that even now brings a glow about the heart as I remember. But that lovely July day is still fresh in my memory because of the vivid contrast between the beautiful white-haired old minister and Macfarlane in the flush of his youth. He treated Mr Ruari with the reverence due to a Bishop. And Mr Ruari told us stories of wonderful drollery. One was of his appearing at the bar of the General Assembly and how that venerable Court was amazed as he told the tale of fords to be crossed, voyages to be made, perils to be faced by those who would keep alive Presbyteries in the Hebrides, and how the Assembly, instead of censuring the Presbytery of Uist, gave him an ovation! He deserved it. 'What a fine old Trojan,' said Macfarlane as we drove back across the ford. There was something wonderfully captivating about Macfarlane. Whether he told you the story of how he burnt his commentaries (when he had the great experience in the depths of his soul); how one book only was worth reading the Bible; how one thing only was to be done - to love and serve the Master; or told you tales steeped in tears and laughter - he always captured the heart. You could not help loving him. He made a great impression on me, but I made little impression on him. At any rate he never sought me out in the after years. But, on the rare occasions when we met, he would greet me just as if we had been in Benbecula together the week before. It did not matter how long the years between may have been, he was as affectionate and warm-hearted as he was when I was but a boy He was in truth the friendliest of men. At a Conference in Oban, in June, 1921, I saw Macfarlane for the last time. The Conference included the United Free Church and the Church of Scotland ministers in Argyll and the Isles, and was presided over by Principal Martin. I vividly remember the impression made on me when Donald Macfarlane at a meeting rose and spoke. He spoke out of the depths of his own religious experience, and, as he went on, I could see the great gathering of ministers and missionaries fall under his spell as I fell under his spell twenty-nine years before. He was just the same. The voice was a little richer; the light in his eye a little brighter; the same play of humour and of deep feeling; the same mesmeric, indefinable emanation by which he made hearts captive. From Sydney Smith's Donald Macfarlane of Gigha and Cara, London 1925, pp. 131-141 Norman Maclean D.D. was born in Skye in 1869 and died in 1952 His ministry, unlike that of his subject in the above sketch, embraced a wider public. He was, for example, appointed Chaplain to the King in 1926 and was Moderator of the General Assembly in 1927 He wrote many books on a range of subjects fiction, social and political, religious biographical and autobiographical (the story of his childhood was told in The Former Days). The Companion to Gaelic Scotland (p 181) observes only that he was minister of St Cuthbert's, Edinburgh, a 'prolific author in English, and a 'Zionist '. The series of severe thunderstorms which passed over this district last week culminated on Thursday afternoon in one of much violence, and at its height a tragedy of an unprecedented nature in our climate occurred at East Backs Farm, the tenant of which, Mr Duncan McCorkindale, a well-known Kintyre agriculturalist, was killed by lightning while following the day's work. In the afternoon Mr McCorkindale and his ploughman, Mr James Macdonald, were engaged repairing fences. Discontinuing this occupation, Mr McCorkindale decided to have a look through his sheep before returning to the farmhouse. Macdonald accompanied him, and the two men were on the hilI (sic) where the sheep were grazing when the storm broke. They were standing conversing near the fence, when the electric current struck Mr McCorkindale, killing him instantaneously. So sudden and unexpected was the tragedy that the ploughman only remembers a momentary blackness, followed by complete unconsciousness for a period which he could not measure by time. When Macdonald came to himself he could but dimly realise the tragic fate which had overtaken his master and his own miraculous escape from death. The shock was such that he was quite unable to walk, and he began to crawl painfully in the direction of the farmhouse, helping himself along the fence. When he got within hailing distance of the house he was able to cry out, and was heard by the fanner's son, Mr John McCorkindale. In an indefinite sort of way Macdonald was able to indicate that something terrible had happened, and on Mr John McCorkindale hastening to the hill he found his worst fears realised. The deceased was lying a short distance from the fence, with his sheep dog about four yards behind him, also dead. Dr J. P Brown was summoned from the town and the police informed of the tragedy, but Mr McCorkindale was beyond all human aid. The lightning had struck him with incredible swiftness, causing death in the smallest fraction of time. An examination of the body showed that the current had travelled down the left side, and the left leg, which was fractured below the knee. It passed out at the left heel, shattering it. Deceased's clothing was tom into shreds and burned and singed in parts. His boots were also tom asunder Only the face and head remained untouched. The dog bore no marks, and had evidently been killed by shock. Macdonald, who had been standing between his employer and the fence at the time of the occurrence, suffered severely from shock, both physical and mental, but obviously he had been out of the line of the current and his state was due to the air displacement which would occur when the lightning struck. A clear track of the lightning's course from the fence to its victim, or vice versa - which of the two possible directions it took not being certain - was to be observed on the ground. A small terrier dog which accompanied the men also appears to have been in the area of the current. It reached the farm before the alarm was given, limping and whining, but the tragic cause did not reveal itself till some time later. When the facts of the appalling tragedy became known in the town and district, they created a painful sensation, as the death of a human being from this cause is quite unprecedented in the knowledge of anyone living. Widespread sympathy was expressed for the bereaved family at East Backs, Mr McCorkindale being survived by his widow who is a daughter of the late Mr William Buchanan, farmer, Skeroblin - and a family consisting of one son and two daughters. Deceased was 73 years of age. He went to East Backs In his boyhood with his parents, and succeeded his father in the tenancy of the farm, which has been held by father and son for 61 years. All his days Mr McCorkindale was held in high regard and esteem by all who knew him. He was of a quiet and retiring nature and took no active part in public affairs, but was recognised as an industrious and capable agriculturalist and an estimable citizen. His death in the course of the day's work and under such poignantly distressing circumstances has occasioned the deepest regret. The funeral took place on Monday to Kilkerran Cemetery, and the sympathy of all classes was shown by the remarkably large numbers of mourners who attended to pay a last tribute of respect to the deceased and express in this way their sympathy with the bereaved. Mr James Macdonald, the ploughman, whose home is at Plantation, was removed there in the evening, and has been receiving medical attention ever Since, but it is pleasing to learn that he is making satisfactory progress towards recovery. A Third Summer in Kintyre, Angus Martin, Grimsay Press, � 12.95. This is the final book in the trilogy of 'Summers in Kintyre' which Angus Martin has produced. The contemporary diary dates range from I April to 15 September, 2015, but once more Angus uses these dates as a framework on which to hang his records and memories which go back many years. There arc photographs and remembered incidents back to 1957, and accounts gathered from oral sources, from journals and publications and from historical sources which go back many years before then. The reader is invited to accompany Angus on the highways and byways of Kintyre. On these journeys we follow him on his searches, some hair-raising ones, for the flora and fauna of the area. In encounters, some casual and some intentional, he records the remembered stories of the place. The accounts of the stone quarried from Davaar Island are certainly worth their place in this book, particularly in relation to its use as the building clocks in the break-away church in Longrow. This is part of the eighteenth century 'patronage' struggle within the established church of the time, but the building also stood, as Angus writes, 'as a monument to the democratic imperative'. And that at a time in history when political democracy existed only in unrealised dreams! The story of the Sailor's Grave at Inneans Bay also makes fascinating reading, demonstrating humanity and dedication on the part of the many people who have, over the years, been responsible for the grave-marker and its survival. The suggestion in the book that the time has come for a more permanent monument will surely attract the support it deserves. He also records his encounters with some of the significant literary figures of Scotland in the second half of the twentieth century. These include Edwin Morgan, lain Crichton Smith, George Campbell Hay and many others. It is indeed regrettable that an accident caused the loss of much of the correspondence with these luminaries. Angus Martin shows himself to be a determined etymologist, eager to examine the original Gaelic of a place-name 'in search of its roots, and also to consider the lives of those long ago who lived and worked in these places. Those who wish to pursue an interest in place-names, their derivations, evolution and human interest, would do well to consider his work here on Deuchran and Lurgan (pp. 120-26). For a more extensive look at the history of place-names in the area, his book, Kintyre Places and Place-Names (2013), is an excellent resource. It is as an observer of the natural world that Angus gives us unexpected insights in this book. He quotes one contributor as saying, 'There arc certain things in life you see only once, and are lucky to see' (p 127), and those of us who 'go off the beaten track' arc only too aware of the veracity of that statement. And so the reader is treated to descriptions of Angus descending screes, scaling too-steep cliffs, and continuing a walk when it was better to retreat. All this was in pursuit of a plant which he was keen to identify and record. It is also important to acknowledge the efforts he makes to check his findings with other sources, including human sources he considers expert. Once again in this book Angus displays his great love for the area in which he lives. Thanks to his efforts and the standard of his presentation, a treasure trove of human and natural history is available today and for future readers and students. This is an informative and well-researched book, but, above all, a pleasurable read. 2018 Harold A. Ralston, Racine, Wisconsin, USA.